Nintendo on Tuesday revealed that the first-ever mobile game featuring everyone’s favorite plumber will arrive in time for the holidays. Super Mario Run was unveiled alongside the iPhone 7 and iPhone 7 Plus during Apple’s September media event by none other than Shigeru Miyamoto, the legendary game designer and producer responsible for many of Nintendo’s hit franchises. Super Mario Run is a side-scrolling, auto-running platformer in which you play while holding your device vertically (portrait style). There’s a good reason for that as the game is designed for one-handed play. Many familiar elements from the Super Mario Bros. franchise are present in this game such as pipes, Goombas, power-ups and yes, even Bowser. Something else you’ll be familiar with is the process of collecting coins although as you can see in the clip above, things work a bit differently than normal. When Mario jumps off a platform to his death, he’s magically brought back to an earlier point in the map at the expense of a few coins. This style of play is somewhat reminiscent of Nintendo’s arch rival Sega and its mascot Sonic the Hedgehog who could (in certain instances, at least) stave off death at the expense of coins he had collected. 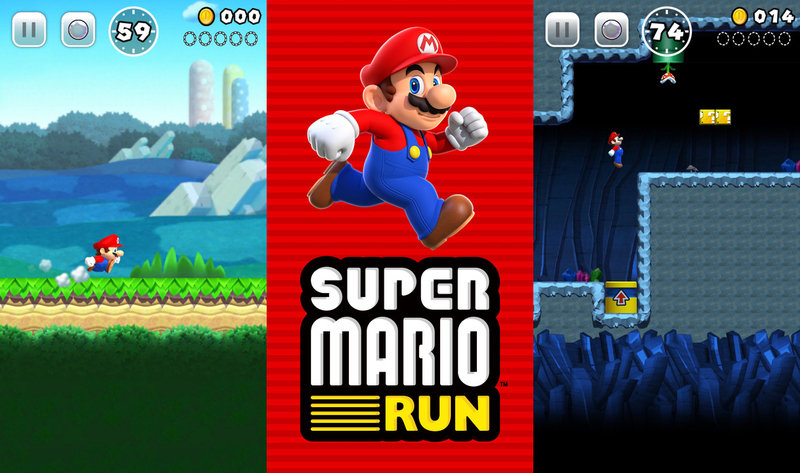 Super Mario Run is scheduled to arrive on Apple devices (iPhone, iPad and iPod touch running iOS 8 or later) in 151 countries and regions on December 15 as a free download, allowing players to try elements of the game’s three modes (the main game, a “Toad Rally” time attack mode with “ghosts” that should be familiar to anyone that has played Mario Kart and a “Kingdom Builder” mode that lets players build their own kingdom using coins earned from the two other modes) at no cost. An optional, one-time fee of $9.99 will grant unlimited access to each of the three modes, Nintendo says. Between Super Mario Run and the NES Classic Edition, Nintendo is poised to finish 2016 in grand fashion. Nintendo made no mention as to when Super Mario Run would launch on Android devices although the company did say earlier this year that the game would make the transition to Google's mobile OS at some point in the future.